Turns out for “killer whales”, it’s all of the above. Scientists have wrangled for years over whether there is a single species of orcas, or whether the orcas that eat dolfins are different from orcas that eat only fish from orcas that eat seals and other cetaceans. The three images above may look the same, but the killer whale (top) lives in the Northeast Pacific and eats marine mammals. The “pack ice” killer whale (center) hunts seals in Antarctic waters, and a “Ross Sea” killer whale dines on fish under the Antarctic pack ice. Do the different ranges and different dining habits make them different? It turns out that mitochondrial studies say: yes! Mitochondria are a small organ in every cell that convert food molecules to energy, and they have their own DNA that is separate from the DNA in the cell nucleus. Mitochondrial DNA is often used as a type of molecular clock to measure the time elapsed after two genetic lineages of animals, plants or birds shared a common ancestor. The most recent studies show that the molecular clocks of killer whales and other cetaceans have molecular clocks “tick” more slowly than in other species, according to Phillip Morin of NOAA’s Southwest Fisheries Science Center in La Jolla, Calif. This means that previous Mitochondrial DNA studies of orcas were flawed. Morin and colleagues, instead analyzed the full mitochondrial genomes of 139 killer whales from around the world. 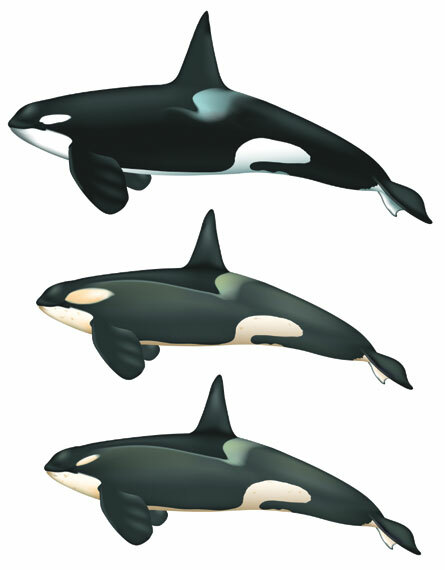 They found that the animals fall into several genetically distinct groups, including 3 distinct species of Arctic orcas (shown above). “The genetic data show that they are each independently evolving lineages, . . .” according to Morin. New species typically appear after geographical isolation separates several groups of a single species into separate breeding populations. Since orcas don’t have physical barriers to keep them from breeding with each other, some researchers concluded in the past that geographic isolation wasn’t enough to divide them into separate species, but the latest Mitochondrial DNA evidence indicates otherwise. One final note: Some scientists believe that orcas are the only closely related species that kill and eat their close genetic relations, other than humans. What does that say about intelligence? 4 Responses to Killer Whale Genetics – Who’s Tastiest? So what do we know about the Orca in the gulf Where do they fit in to the sceme of things? Are they a seperate species again or are they a transient Orca? Orcas in the Gulf of Mexico? Fun! Are there pods living here permanently, or just curious/adventurous individuals? Where?